Alongside the new camera, Fuji unveiled two new lenses for the system – the XC16-50mm II and the XC50-230mm II. 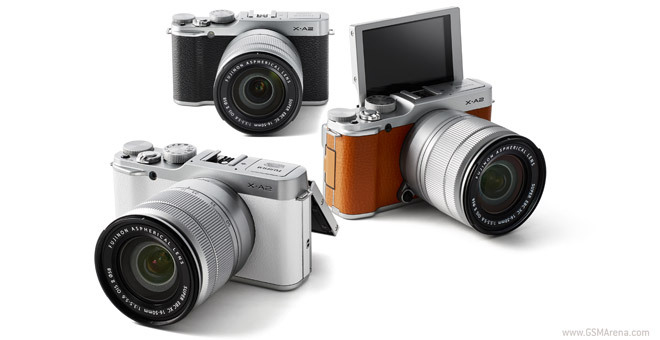 The Fujifilm X-A2 features a 16.3MP APS-C sensor backed by an EXR Processor II. The new model has improved auto focus with eye auto focus, Auto Macro AF and Multi-Target AF. The AF speed is 0.3s, while shutter lag is 0.05s and ISO ranges from 100 to 25,600. For video recording the X-A2 offers 1080p @ 30fps capture. Optical image stabilization is on board and adds 3.5 stops for low light and telephoto shooting. Anyway, the camera supports Wi-Fi and can transfer photos to a smartphone (iOS or Android) and can wirelessly print them on an INSTAX Share Printer. There’s built-in RAW processing and a mode that simulates Classic Chrome film. As for the two lenses, the Fujinon XC16-50mm II ranges from 24mm to 76mm (in 35mm equiv.) with the aperture going from f/3.5 to f/5.6. It’s an optically stabilized lens with 12 all-glass elements. The Fujinon XC50-230mm II is also stabilized and goes from 76mm to 350mm, f/4.5 to f/6.7. It features a precise stepping motor for fast autofocus. The Fujifilm X-A2 kit (with an XC16-50mm) will be available this February at USD 550 / CAD 600. It will come in Silver, White, and Brown.